The Yankees did not fare well as their ace struggled on Monday. He struck out eight hitters, but allowed 11 hits and seven runs. 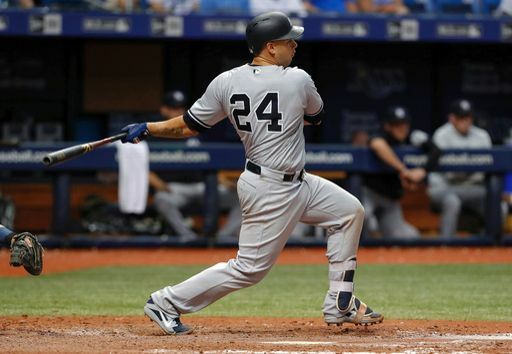 The Yankees clawed their way back, but Gary Sanchez did not run out a miscue by the Rays infield and the Yankees left the bases loaded down one run to end the game. There was a shaky start in the bottom of the first inning as Luis Severino gave up his first run due to a two out double by Jake Bauers who went on to score from second during the following at-bat by former Yankee Ji-Man Choi on a passed ball. After the run, Choi singled but Severino ended the inning with a strikeout of Joey Wendle. The offense quickly made up the run for Sevy in the top of the second inning, however. After the top of the lineup went down in order in the top of the first, Giancarlo Stanton started the second inning with a double, and was followed with a walk by Aaron Hicks. Gary Sanchez popped out and Greg Bird struck out swinging to bring up Miguel Andujar, the man who is finally dismissed of the threat of Manny Machado stealing his job, who came up with a two-out, two-strike single to score Stanton and tie the game. Severino began the bottom of the inning with a single to Daniel Robertson. Sevy dialed himself in after that, beginning a streak of six straight perfect outs, including his 500th career strikeout after fanning Willy Adames, becoming only the third Yankee to strike out 500 batters before the age of 25 behind only Al Downing and Lefty Gomez. In the bottom of the fifth inning, Severino ran into more misfortune, as a ball that would’ve been hit into the shift down the middle for an inning-ending double play by Matt Duffy ended up hitting the ace and redirecting into left field to extend the inning. Bauers hit a home run in the next at-bat, because, of course runs result out of a play that should’ve ended the inning. The Yankees got a couple runs back in the next frame as Giancarlo Stanton continued his red-hot hitting at the Trop, starting the two-out rally with a hard-hit single to right. Hicks then reached on an error at second base by Daniel Robertson that moved Stanton to third. The Bombers then got their first run of the inning on a passed ball that scored Stanton and moved Hicks to second, ironically with Sanchez at the dish, who ended up hitting a single to score Hicks. Daniel Robertson quickly made up for his error with a home run on the first pitch of the sixth. Mallex Smith hit a double three pitches later, which got Chad Green up in the bullpen. Adames singled to move Smith to third and end Severino’s night all in one swing of the pine. Sevy’s final numbers were 5+ innings, 7R, 6ER, 11H, and 2HR. Green gave up a single to Jesus Sucre to score Smith and make the score 6-3 and, later in the inning, Duffy beat out a double-play to save the inning and score Adames. The Yankees got the tying run to the plate in the top of the seventh with three straight one out walks by Neil Walker, Brett Gardner, and Aaron Judge. Didi Gregorius grounded out to first, but moved the runners over, scoring Walker from third. Giancarlo Stanton got his fourth base hit of the game to knock in Gardner and Judge and pull the Yankees to within one run. Hicks then ended the inning by striking out looking. Adam Warren began the bottom of the inning giving up two base runners but worked his way out of the jam by striking out Robertson, Smith, and Adames in order. Gardy started off the top of the ninth with an infield single to third, Judge then walked and Didi sacrificed them both over to second and third. The Rays elected to intentionally walk the red-hot bat of Giancarlo Stanton to bring up Aaron Hicks, who grounded into a fielder’s choice where Duffy got the out at home to prevent the run, bringing up Gary Sanchez. The Yankee catcher proceeded to hit a hard hit ball down the middle into the shift where, in a bizarre sequence of events, Daniel Robertson tried to toss to second to get a force out, with Hicks beating that out; however, Sanchez dogged it out of the box, he was then thrown out at first by three steps at first to end the game. The Yankees look to even the series tomorrow at 7:10 PM EST as Tanaka takes on the Rays bullpen.